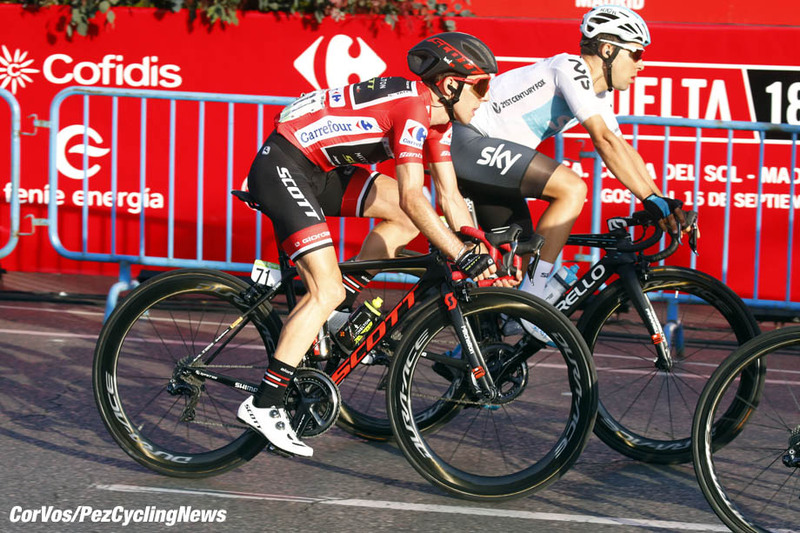 PezCycling News - What's Cool In Road Cycling : VUELTA’18 Final Stage 21: Simon Yates – Campeón De La Vuelta! 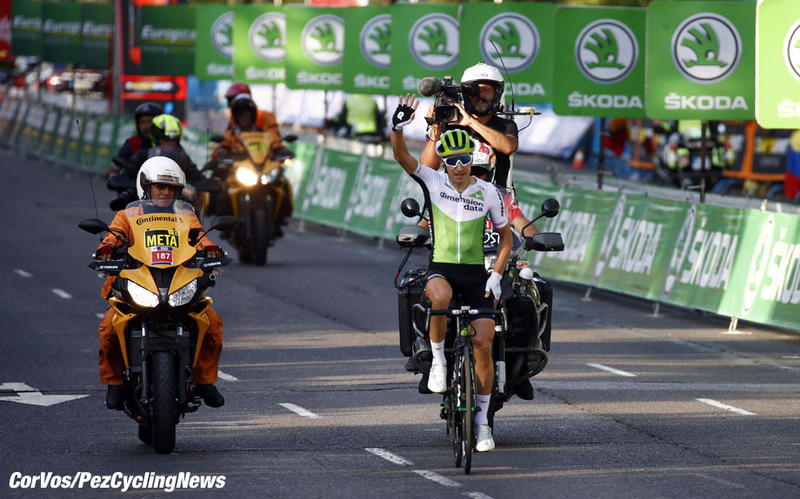 VUELTA’18 Final Stage 21: Simon Yates – Campeón De La Vuelta! 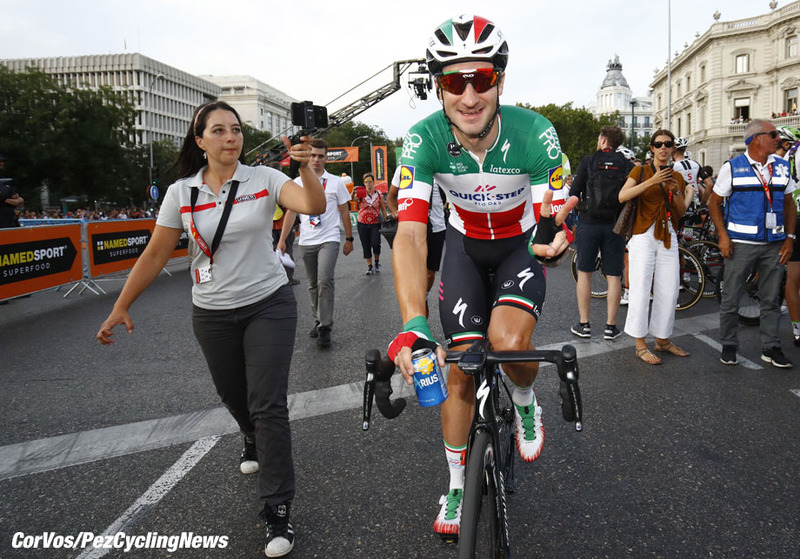 Stage Report: Italian champion, Elia Viviani took his third Vuelta stage win of 2018, yet another victory for the Quick-Step Floors team, but the day belonged to Mitchelton-Scott's Simon Yates. Overall winner of the Spanish Grand Tour and the victory was taken with panache and set a record for British Grand Tour wins. 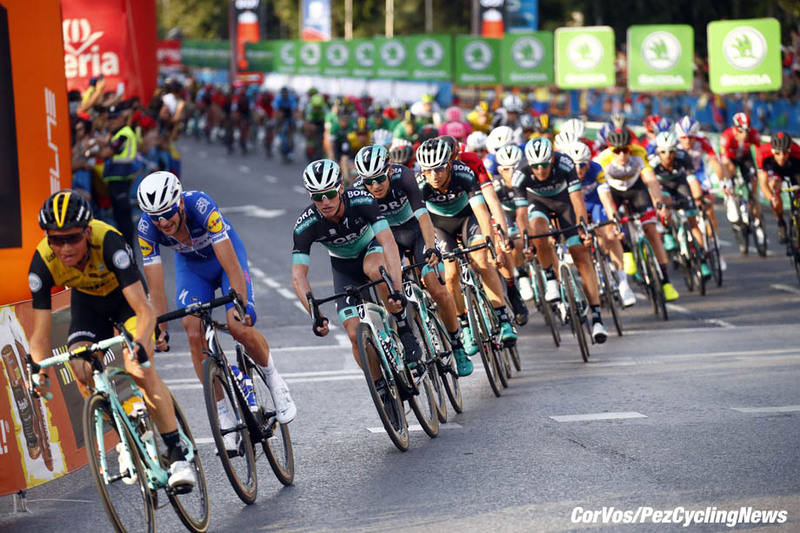 The final stage 21 of the 2018 Vuelta a España ended with the usual and spectacular bunch sprint in Madrid. Elia Viviani (Quick-Step Floors) proved again he is the fastest with a third stage victory, ahead of the World champion Peter Sagan (Bora-Hansgrohe) and Giacomo Nizzolo (Trek-Segafredo). Simon Yates (Mitchelton-Scott) made it through the stage without any problems to take the overall win of La Vuelta'18, his first Grand Tour success and the fifth in a row for British riders. Three weeks after taking off from the Pompidou Centre in Malaga, we close the modern art circle with the MAVA (Municipal Glass Art Museum) in Alcorcón, which has spent the past 20 years promoting this contemporary discipline in the Grand San José de Valderas Castle, built 100 years ago and recently restored - an artistic luxury in which to host the final departure of La Vuelta 2018. 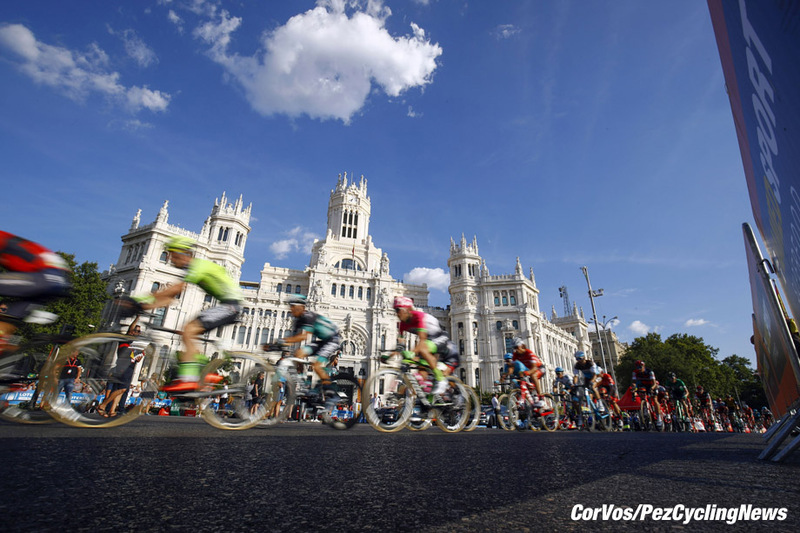 The La Vuelta peloton rides again, yet another year, amongst Madrid's most emblematic buildings in order to bid farewell to the race's 2018 edition. One of this route's usual witnesses is the Prado Museum. This year, the Spanish picture gallery, one of the most important in Europe, prepares for its second centenary celebrations. The circle we began to trace through the Malaga museums will come to a close by greeting one of our country's most iconic art centers. Fernando Escartín: "Final day that will serve as a tribute to the rider wearing La Roja. It will consist of a short route, where riders can ride slowly, but with an intermediate sprint and an arrival for explosive sprinters, which may decide who wins the green jersey, just like last year." 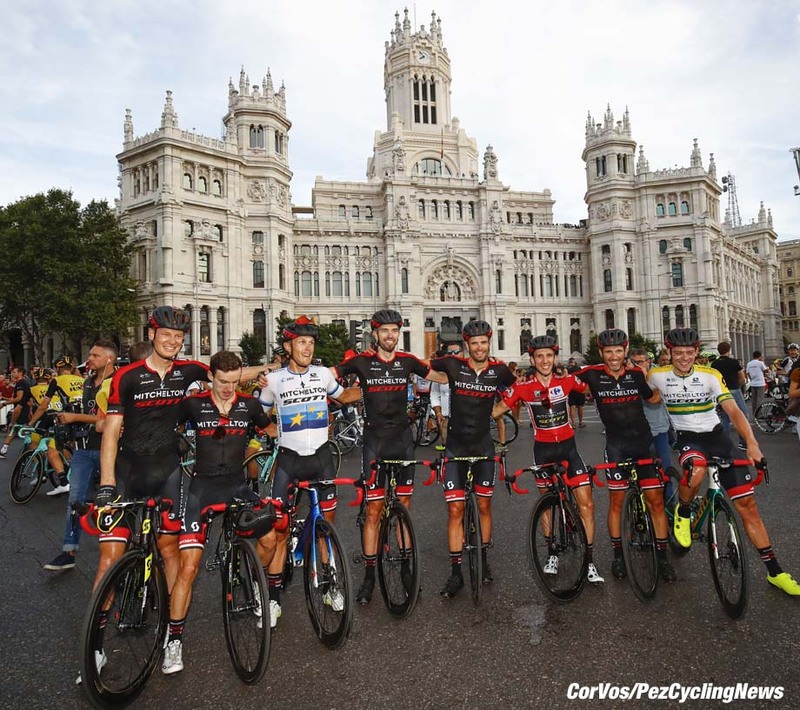 The pack enjoyed the first sunny 30 kilometres leading to Madrid to celebrate the winners of La Vuelta'18. 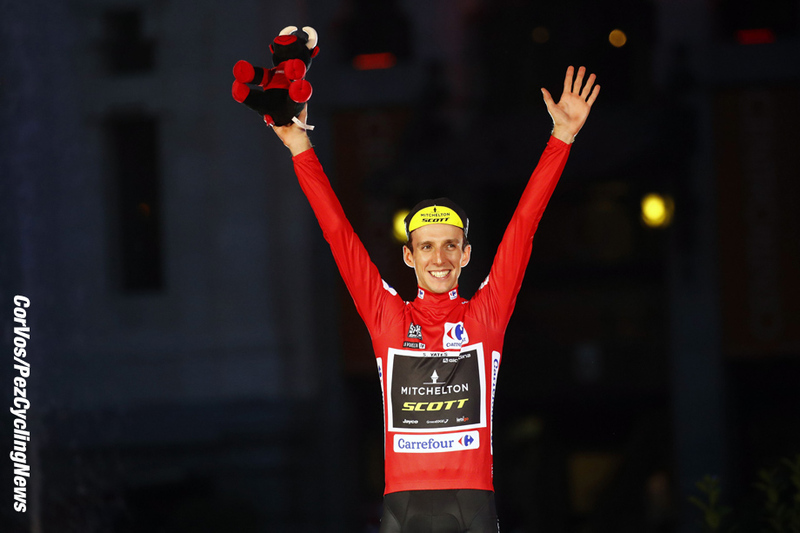 Simon Yates’ Mitchelton-Scott were wearing a new black and red jersey for the occasion. The British winner of the race also celebrated his triumph with runner-up Enric Mas (Quick-Step Floors) and Miguel Angel Lopez (Astana), 3rd on general classification. Igor Anton (Dimension Data), racing for the last time as a professional rider, crossed the line slightly ahead of the bunch with 11 laps of 5.9km circuit remaining. The battle went on with 59km to go. 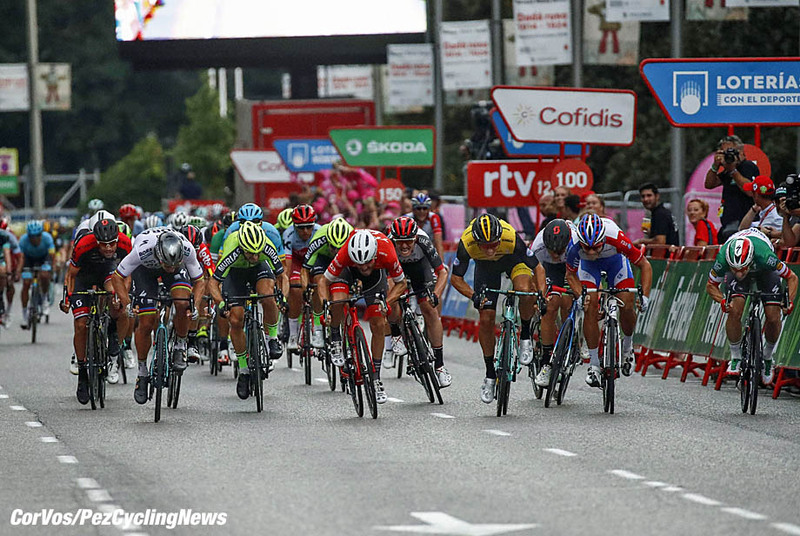 A group of six riders jumped ahead of the bunch: Alessandro De Marchi (BMC), Tiago Machado (Katusha-Alpecin), Jetse Bol (Burgos-BH), Loïc Chetout and Stéphane Rossetto (Cofidis) with Mikel Iturria (Euskadi-Murias). The sprinters’ teams quickly got into action. The attackers never opened a gap more than 20 seconds and were caught 44 kilometers from the finish. 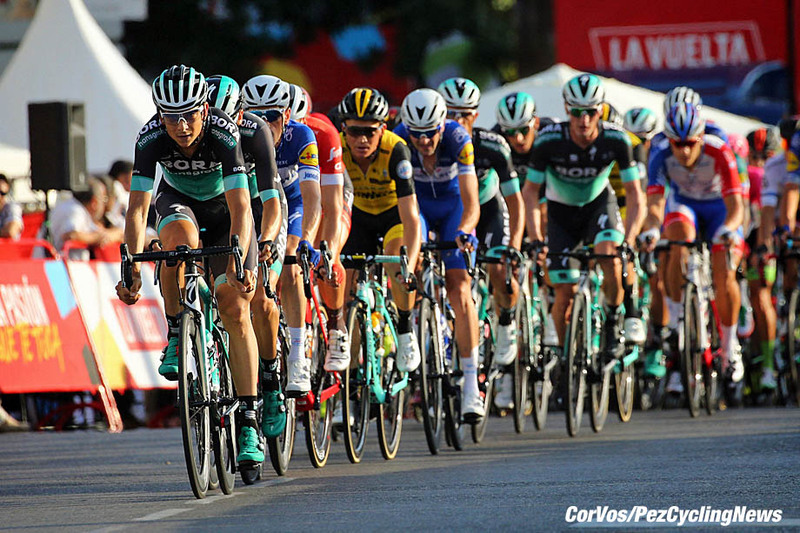 Diego Rubio (Burgos-BH), Joey Rosskopf (BMC) and Nikita Stalnov (Astana) immediately launched a new attack and Garikoitz Bravo (Euskadi-Murias) quickly joined them at the front. The pack controlled the gap around 15 seconds. Nikita Stalnov dropped back to the peloton after a puncture with 27km to go. The attackers were finally reeled in with 7 kilometres to go. 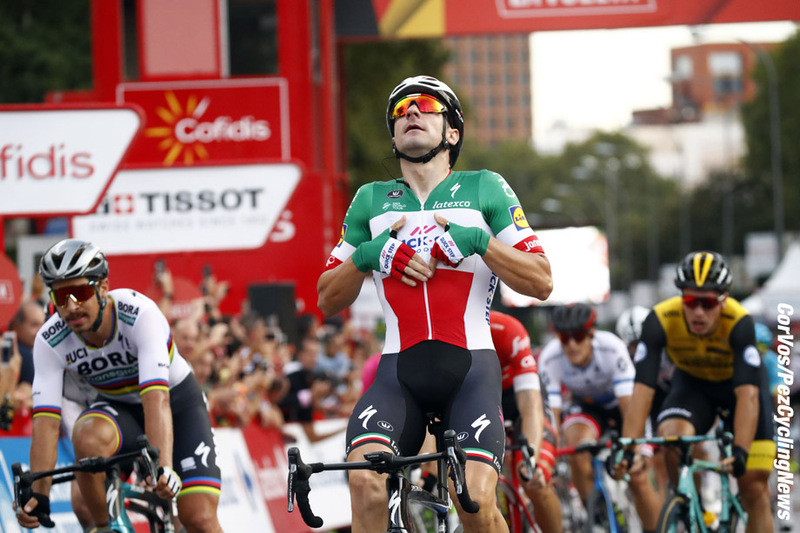 Sprinters’ teams struggled to offer a proper lead-out to their fast men but that didn’t bother Elia Viviani, who came past everyone to celebrate his third stage win. Simon Yates (Mitchelton-Scott) finished safely to seal his overall victory. 25. Wilco Kelderman (Ned) Sunweb.